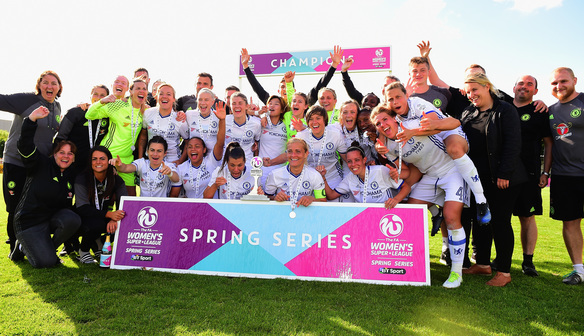 Karen Carney and Fran Kirby were on target as Chelsea comfortably beat Birmingham City to be crowned FA WSL Spring Series champions. Former Birmingham winger Carney struck home a 22nd-minute penalty and striker Kirby hit the clincher 13 minutes into the second half. It was not only a deserved title success for Emma Hayes’ team but also sweet revenge for April’s SSE Women’s FA Cup semi-final defeat to their hosts. Heading into what promised to be a nail-biting final day of the campaign, any one of four teams might have taken the title. But leaders Chelsea were in pole position and duly triumphed, in the process denying second-placed Manchester City a fourth successive trophy. Carney opened the scoring from the spot after Kirby had been barged over by goalkeeper Ann-Katrin Berger, who was booked for the clumsy challenge. Winger Gemma Davison and Kirby both missed simple close-range chances to increase the lead before the interval. But Kirby made amends when she tapped home the second goal after Davison’s 58th-minute cross had been spilled by Berger. The visitors then coasted to the title, captain Katie Chapman triumphantly lifting the trophy as she and her colleagues collected their winners’ medals. “It feels great to have won the title. There was pressure going into the game against a Birmingham team who we know are very good defensively. “We had to be patient and we did that well. “My goal was a tap-in but I was in the right place at the right time and I was delighted to keep my scoring run going. “I thought that overall it was a very professional performance by us and it showed that we’re winners, a team that just wants to go out there and win. “Manchester City have been winning titles so this was an important one for us, this is our trophy and we’re going to take the impetus into next season. “On a personal note I’ve had a long journey on the road back from injury, I’ve had to push myself to the limits to get myself fit again. “But I’ve kept myself positive and I’ve had tremendous support from the girls, who have been absolutely brilliant with their support." “We knew it was going to be a difficult game, as it always is against Chelsea. “After the goals they’ve been scoring lately we didn’t want to concede early, so our gameplan was to sit back and invite their pressure but stay tight. “In the second half Chelsea showed their quality and put us under a lot of pressure. “This Spring Series has been a bit of a mixed bag for us, and we’ve certainly not finished as high in the table [seventh] as we’d have liked. “The highlight was getting to the FA Cup final and playing at Wembley, and that was a fantastic day for everyone involved in the club. “Unfortunately we lost out to Manchester City, but it was a great experience for us all and one that we hope to repeat in the future. Birmingham City (3-4-1-2): Ann-Katrin Berger; Meaghan Sargeant, Aoife Mannion, Kerys Harrop; Sarah Mayling, Marisa Ewers, Jess Carter, Paige Williams; Abbey-Leigh Stringer; Ellie Brazil, Rachel Williams. Substitutes:Charlie Wellings for Carter 63, Freda Ayisi for Ewers 70. Substitutes not used: Sophie Baggaley, Andrine Hegerberg, Chloe Peplow, Connie Scofield, Emily Westwood. Chelsea (3-4-3): Carly Telford; Gilly Flaherty, Deanna Cooper, Millie Bright; Gemma Davison, Katie Chapman, Maren Mjelde, Crystal Dunn; Karen Carney, Fran Kirby, Ji So-Yun. Substitutes: Ramona Bachmann for Davison 64, Drew Spence for Kirby 79, Erin Cuthbert for Ji 90. Substitutes not used: Frances Kitching, Hannah Blundell, Beth England.